he capital of Uzbekistan is Tashkent and home to the Tashkent International Airport, the largest in the country, connecting the city to Asia, Europe and North American continents – it is situated in a well-watered plain to the west of the Last Altai Mountains on the road between Shymkent and Samarkand. Tashkent sits at the confluence of the Chirchiq River and several of its tributaries and is built on deep alluvial deposits up to 49 feet. Tashkent features a Mediterranean climate with strong climate influences. 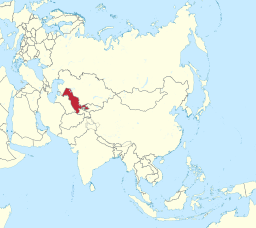 As a result, Tashkent experiences cold and often snowy winters not typically associated with most Mediterranean climates and long, hot dry summers. Winters are cold and often snowy, covering the months od December, January and February. Most precipitation occurs these months which frequently falls as snow. The city experiences two peaks of precipitation in the early winter and spring. The slightly unusual precipitation patter is due to its 1600 feet altitude. Summers are long in Tashkent usually lasting from May to September. Tashkent can be extremely hot during the months of July and August. The city also sees very little precipitation during the summer, particularly from June through September. The city of Samarkand is city in modern-day Uzbekistan and is one of the oldest continuously inhabited cities in Central Asia. Located in the north-east, in the Zarefshan river valley. Featuring a Mediterranean climate that closely borders on a semi-arid climate with hot, dry summers and relatively wet, variable winters that alternate periods of warm weather with periods of cold weather. Most of the sparse precipitation is received from December through April.